World’s End State Park is located in Forksville, which is northeast of Montoursville in Sullivan County, PA. I am familiar with it because my father-in-law belongs to a camp in the neighboring town of Hillsgrove. I’ve gone up to that camp multiple times and love the area. So when I heard there was going to be an ultramarathon held close by, I jumped at the opportunity and signed up for their 50K. Most of the course is on the Loyalsock Trail. I have always wanted to run or hike on the LT and now was my chance to explore it. Saturday morning came very early for both my wife Caryn and I. She surprised me a few weeks back by saying she would drive me up and crew and support me. The race started at 7:00am so we hopped in the jeep at 4:15am and took off. The forecast called for a warm and humid day with a chance of rain in the afternoon. We had a briefing by the race director at 6:45am on some specifics about the course, it’s markings, and rattlesnakes. He said there could be a possibility that we’d run in to one. I have become accustomed to them now, and nonchalantly look for them on my trail runs. Unfortunately, on this race, I did not see or hear any. 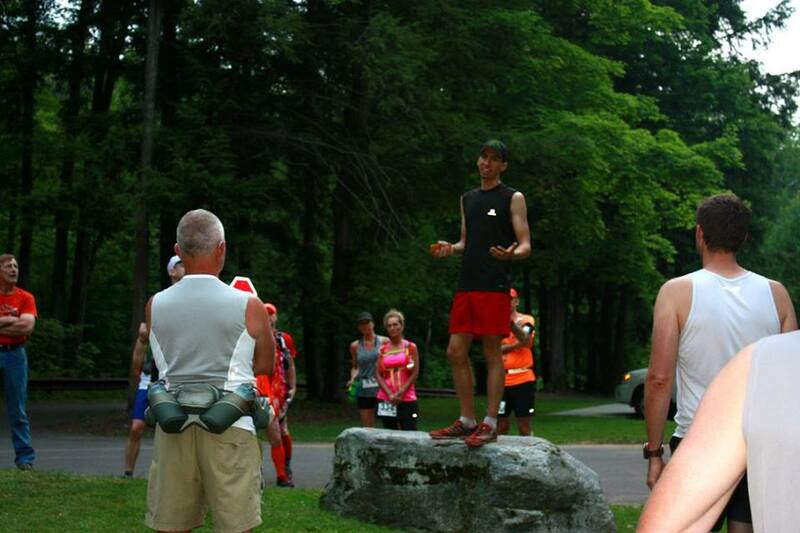 Here is the race director giving us some good info…..
My trail running friend Gary was also doing the 50K. We started off on a dirt road and like main ultras, abruptly went off-road within the first half mile. Within 2 miles, we were climbing our first mountain. The first aid station was early, around mile 3. It was well placed, because once I stopped to get two orange slices, we immediately started climbing again…and this was a larger mountain. Once we crested the mountain, the trail opened up and could get some good running in. Throughout the day, I heard multiple people say how surprised they were about how runnable much of the trail is. I was expecting more rocks and less “groomed” single track. I was somewhat concerned about the humidity, since it got to me a few weeks ago in another race and basically caused me to DNF. I made sure this time around my head was on straight and I took my time early on. That is exactly what I did. I was in no hurry with this event. With it being a brand new race, I wanted to take a step back and enjoy the beauty of it all. If I liked what I saw, I’d be back next year and “get after it”. My wife Caryn told me at the AS that someone on a bike had seen a bear not to far away from the AS. Thank goodness when we left, we were heading in the opposite direction! Gary and I separated multiple times throughout the first half of the race, and that was fine. We made no plans of running with each other. We run our own runs. We decide how little or how much to get out of it. I always tell myself in any type of race to run within myself. Don’t let anyone dictate or control my pace or feelings during it. Unfortunately, it was also around that time that Caryn told me that Gary was starting to cramp up. It was early for one to start cramping with half the race left to go. I had a decision to make. Should I run my own race, and possibly have that great feeling of finishing strong(Minqua-like stealth action) or should I help a friend out and stick with them to pull them through. I decided that if I caught back up to Gary, I’d stick with him to the end. 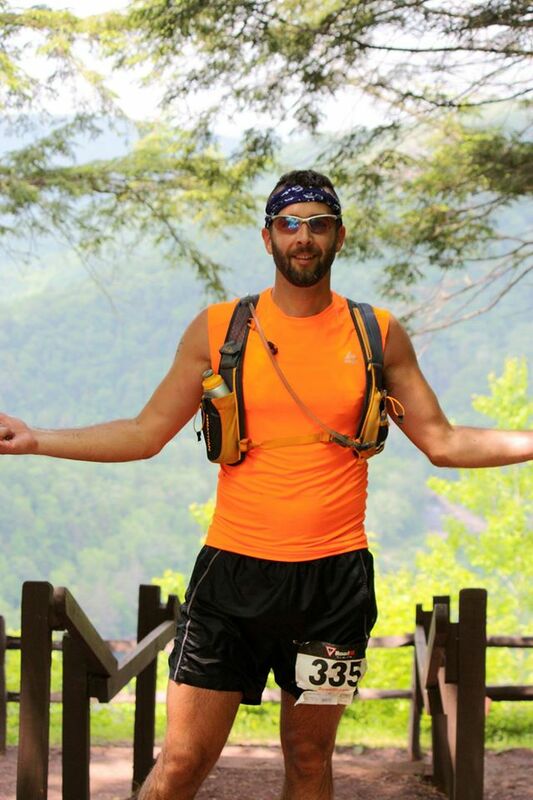 This was a beautiful day, with beautiful views, excellent trails(by the way it reminded me entirely of the A.T. runs in PA last year), vistas, and was a new course. I thought holding back and enjoying it a little bit with a trail running friend would be the best choice. I eventually caught up to Gary. We logged some good miles together and eventually got to AS4. Caryn was there and she had pickles, watermelon, and chips ready for me. They are my main 3 “go to” foods at AS’s….oh, and Coke, but we didn’t have any at the time. The actual AS4 did have Pepsi and Ginger Ale, so I took advantage of that also. Here we are approaching the AS…..
I’m glad I fueled up, because we had an immediate climb up a mountain after that. 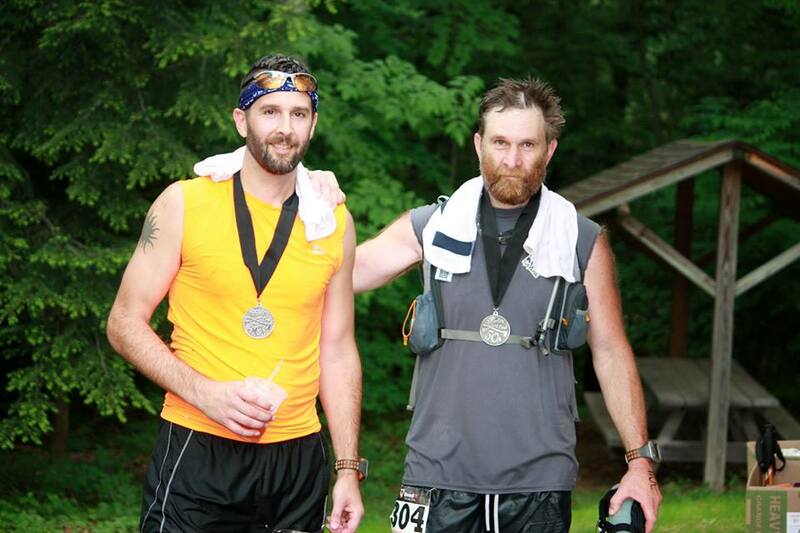 We ran into Gary’s trail running friends Mike and Laura, who have lots of runs and experiences under their belts. At the top of the climb, and around mile 22, we came to the Canyon Vista, and another AS. Here I am enjoying the day so far…..
We continued running when possible, and hiking when there were inclines. Rocks and boulders were also scattered throughout the entire park. Like I said, it reminded me of the A.T. runs we ran in PA last year. 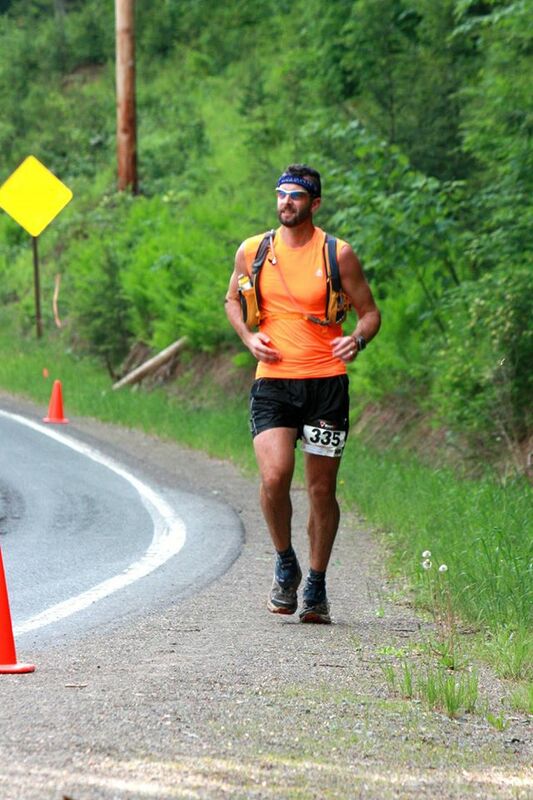 As a matter of fact, while I was running this race, I couldn’t help but think back about last summer’s A.T. adventures. On multiple occasions, a climb over a boulder, or a smell of a fern, or a little stream crossing, took me back to the fun I shared on the A.T. last summer. 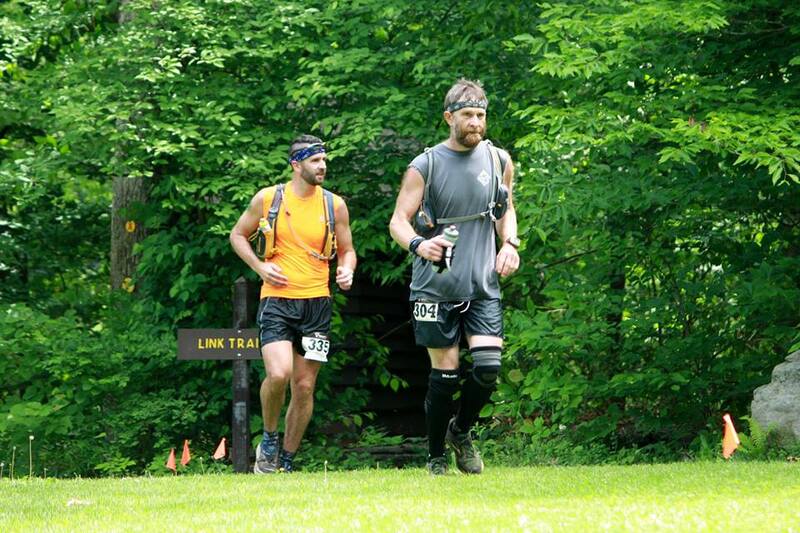 The WE 50K was turning into one of our P.A.T. runs….and I was having a blast! The miles, like Gary and I, continued on. The last AS was roughly 4 miles from the finish. We hovered around there for a good 5 minutes, and then went on our merry ways. On multiple occasions, Gary was telling me to take off and quit holding back. I stuck with him. I know what it’s like when it gets tough. We ran when we could and hiked when we couldn’t. We got back on the World’s End Trail for the final mile down the mountain. We were glad to see the bottom of that mountain and parking area. 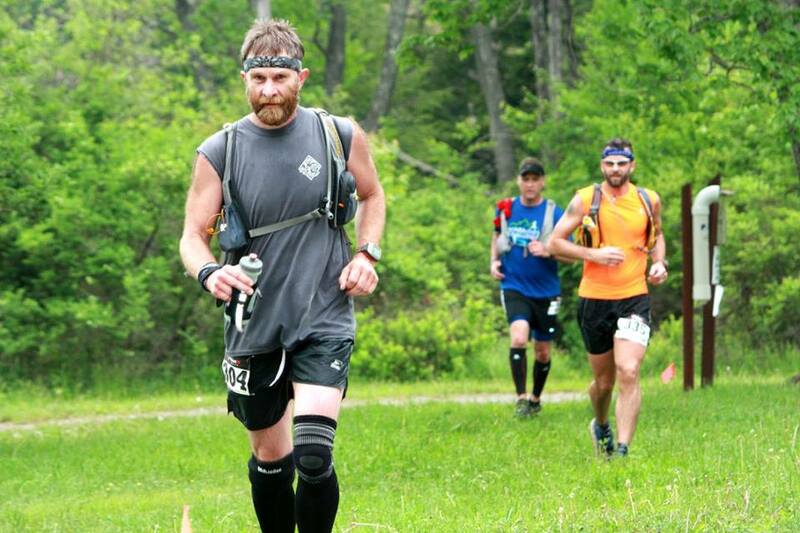 I can’t and won’t say enough about the World’s End 50K. Part of me didn’t even want to post this because I want this race to be a “best kept secret”. The director knows what he’s doing and the post race food was phenominal. I don’t want others to know how nice, and challenging, and runnable, and beautiful, and diverse this race truly is. I know, it sounds completely rude. How could be so selfish of my own kind?! I just don’t want it to sell out in minutes in future years like I know it is going to. And, I don’t know, I may have been sold on it even before it started because of it near a cabin I’ve had some enjoyable times at. But after the race, it was pretty obvious. I really can’t wait to do it again next year!